As a mom of 5 kids, I always feel like I’m packing for an army anytime we go someplace. Going to the pool is no different. Especially if you have a child still learning to feel comfortable in the water. We joined a pool for the first time this year. I’m still freaking out a bit about taking 4 kids to the pool, especially a 5 year old who DOES NOT like to take baths. Fortunately, he seems to be getting over his fear of pools, especially since he sees his older siblings hanging out in the big pool. Getting out the door after I’m finished writing for several hours in the morning could be a major hassle. However, after putting my organizational super powers into the task, I realized that pre-packing the bag shortly after we get home from the pool makes the next trip to the pool much easier. I cover all 12 tips for packing my favorite Lands End tote bag and Columbia insulated bag in the video and share my top 5 tips below. Tip #1: Prepack the bag. 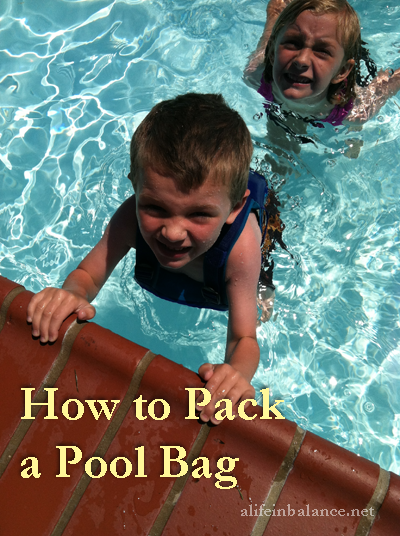 Tip #4: Store kids’ washed swim suits in bag. Tip #5: Keep Mom’s cover up & swimsuit in bag. More tips on the video. We love our Speedo swim vest. We use it all the time with the boys when they are out swimming in the canal. Thanks for the tips. I need some help packing bags for the pool/beach. Lauryn recently posted..Impromptu Chicken Lettuce Wraps Recipe- CSA Style! I love to wash the towels and suits and then put them right back in the car! Trying to sell our house (and keeping it clean) was the original motivation but it makes every trip to the pool and beach a little easier! I really need to just hire you to run my life, Barb! LOL – I’m looking for an assistant, housekeeper, cook, and gardener myself.